These bugs might just be the hardest organisms on the planet. They're the only creatures observed alive inside an electron microscope that actually survived this airless, high-radiation environment. This discovery could mean big things for life on other worlds. One of the basic tenets of scanning electron microscopes (SEM) is that, if you actually want to see anything useful, you first have to kill any biological samples. After all, the powerful electron beam would fatally damage pretty much any organic structure, and the high vacuum used in these microscopes typically requires any biological samples to be totally dehydrated before being studied. These microscopes are designed to look at dead images frozen in time at tremendously powerful magnifications. Different from tardigrades, H. flava in our experiments were hydrated and mobile. Then, the ticks keep their water inside of their body and condition is different from tardigrades in space. The ticks in the present study have a pair of spiracular plates, and they breathe through the stigma in them. Therefore, vacuum conditions may cause severe respiratory system damage and death. Actually, some anti-tick agents are emulsifying agents containing fatty acids such as sorbitan esters of fatty acids, which can seal the stigma. This implies that ticks can be choked to death. 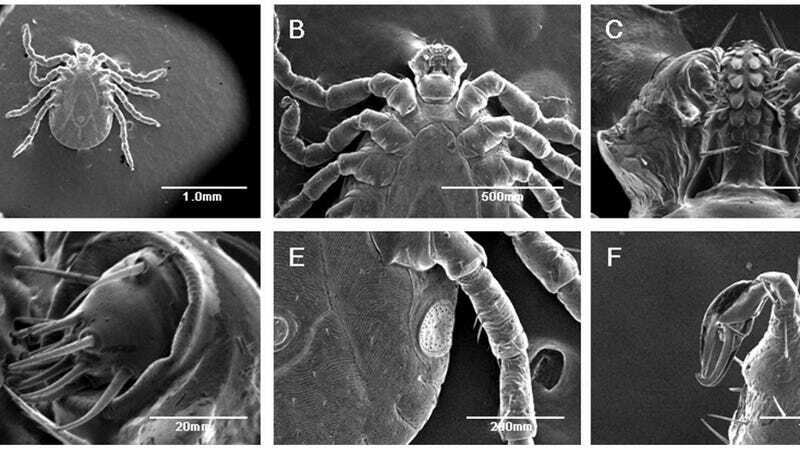 However, from our results, short-term choking did not have a lethal effect on ticks because they lived even under vacuum conditions in SEM for 30-min. Recently, the discontinuous regulation of breath was reported in insects. Some insects quit breathing in order to avoid the damage caused by active oxygen. This result implied their resistance against hypoxic environment. We are speculating that ticks may display vacuum resistance if they have a similar breath-stopping function as shown in insects. Any scientific study that features a line like "This implies that ticks can be choked to death" is the kind of scientific study I can get behind. As it turns out, while the vacuum couldn't kill the ticks, the electron beam could, though only after substantial, prolonged exposure. Even then, the ticks were able to keep moving around under the fierce radiation of the beam long after pretty much any other known organism would have succumbed. The really intriguing question then is, if this particular bug can survive in a vacuum that is constantly showered in high-energy radiation, what does this mean for similar environments on Mars or Saturn's moon Titan? It's at least conceivable that similar bugs might be able to survive on these planets. Whether they could have ever evolved in such unforgiving environments in the first place is another matter entirely, but it's still a pretty damn remarkable possibility. PLoS One via New Scientist. Image from original paper.